May 28, 2008 – she eats. Courtesy of loyal reader, intrepid eater and world traveler Callie, comes today’s article from The Guardian. I’m not squeamish about much when it comes to food: raw chicken, deep-fried insects, honeycomb, other things that look like honeycomb (I have serious visual texture issues with things that look like pores or a series of tiny holes; I have no idea why). But I think that if presented with a plate of squirrel, I’d have to add that to my list. It tastes sweet, like a cross between lamb and duck. And it’s selling as fast as butchers can get it. The Guardian, a UK-based newspaper, recently ran a story on squirrel meat, which is apparently the ethical meat du jour across the pond. It’s worth noting that the squirrel that’s in such high demand is not the tradtional red squirrel, the Squirrel Nutkin-style squirrel that we all grew up with and which is native to the UK. No! To eat such a beloved animal would be unforgiveable. Instead, it’s Nutkin’s far mousier and much more invasive cousin: the North American grey squirrel. The grey squirrel — that familiar and loveable rodent here in America — was introduced to England and Scotland in the early part of the 20th century. It has few natural predators and is hardier and more disease resistant than the native red squirrels. The gray squirrel also has the advantages of being able to eat many more foods than the red squirrel can digest, and can reproduce faster and even under difficult circumstances (which Squirrel Nutkin cannot; he apparently has performance anxiety…). What all of this means is that the red squirrels are slowly being eradicated by natural selection as the gray squirrels take over. The UK has offered many responses to this situation, ranging from flat out shooting the grey squirrels on site to introducing Pine Martens (a type of weasel, and one of the only known predators that kills grey squirrels) into the grey squirrels’ habitats. However, the latest solution is by far the most interesting. You can’t disagree that grey squirrel is an environmentally-friendly choice for meat: it’s locally-acquired, free-range (although this isn’t always a valid argument), there is no grazing or ranching required, there is little-to-no carbon impact in transporting it and you’re ridding the environment of a pest at the same time! But the important question is: Would YOU eat it? 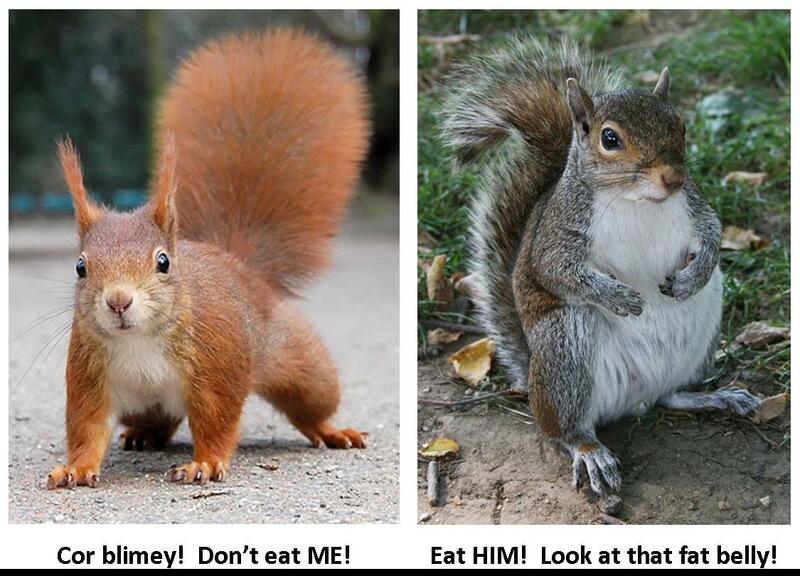 UPDATED: Amusing takes on the squirrel-eating story from SuperVegan and Diet Blog. Posted on May 28, 2008 May 28, 2008 Categories english cuisine, food and the human condition, food news, links, meat / BBQ11 Comments on Squeamish About Squirrel?